Eliminate hose and cord jams for good! Speed Master Detail Guardz are a revolutionary tool that prevents your hose and cords from getting caught underneath your tires during a detail. Made of a heavy duty polyethylene, these strong tools may very well be the most handy detailing tool you’ve ever used! The unique design features a roller system that helps your hose or cord move along the guard and prevents any unnecessary friction, as well as a lip on top and below the rollers that keep the hose contained. The Speed Master Detail Guardz come in a 4 pack, will fit all tires, and takes only seconds to set-up – you won’t know what you’ve done without them for so long! How many times would you say you need to stop in the middle of washing your car to free your hose from underneath your tire? 4? 5? If your answer is anything more than 0 times, the Speed Master Detail Guardz is the solution for you. 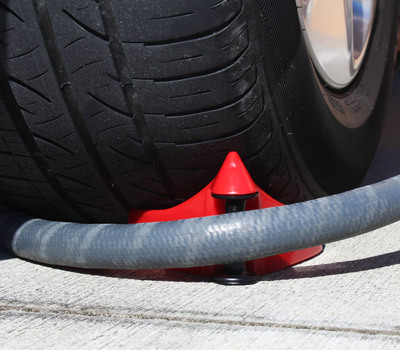 Each guard is placed on the corner of each tire and gently guides the hose around it to prevent catching and jamming. Speed Master Detail Guardz uses a system of rollers to keep your hose moving during a wash instead of getting stuck! Using a system of rollers, Speed Master Detail Guardz is a step above some of the other offerings on the market. Rather than dragging your hose across a plastic surface causing friction, your hose is rolled along and no friction or rubbing is caused. 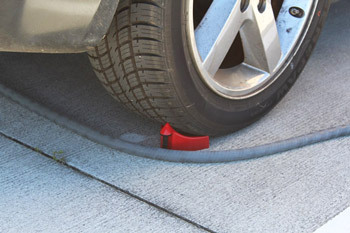 On top of the rollers is a cone-shaped lip that keeps your hose or cord on track. This prevents the hose from accidental paint contact from flailing with a sharp movement. Speed Master Detail Guardz come in a four-pack – one for each tire – and is easily set up in just 15 seconds. Simply fit the Speed Master Detail Guardz underneath each tire and you’re ready to start washing! Speed Master Detail Guardz cease the constant stop-and-go during a car wash by making sure your hose and cords don't get caught! Speed Master Detail Guards can be used on more than just hoses as well! Keep the cord to your vacuum in place during interior details and keep your extension cords from accidentally rubbing against the paint during a machine polish. Speed Master Detail Guardz are so handy, we’re sure you’ll find tons of uses for them! Stop the stop-and-go motion of car washing – use the Speed Master Detail Guards to keep your hose and cords in place, so you can continue to work! Great idea but I need to get use to them. When on they interfere with scrubbing the tires so I remove them. After wheels are clean they are great if i remember to reinstall them. 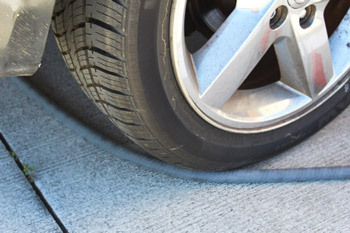 The Guardz prevent power washer and garden hoses from getting caught at a wheel very nicely. I think I need to work with them a few more times to integrate their use into my process. Such a simple thing that makes life so much easier!! Just an awesome little thing that happens to all of us. Body shops, detailers, mechanics. Works great. When I received these "Guardz" I was concerned they would be too light to stand up to having a hose jerked around them. They jam under the tire and don't slide out and make moving my hose around a vehicle a breeze. One of them even worked after I ran over it with a Tundra, but I don't recommend that. Relly love this things. I have a big truck with some big tires and im tired of getting the hose stuck on my tires. Great gadget.